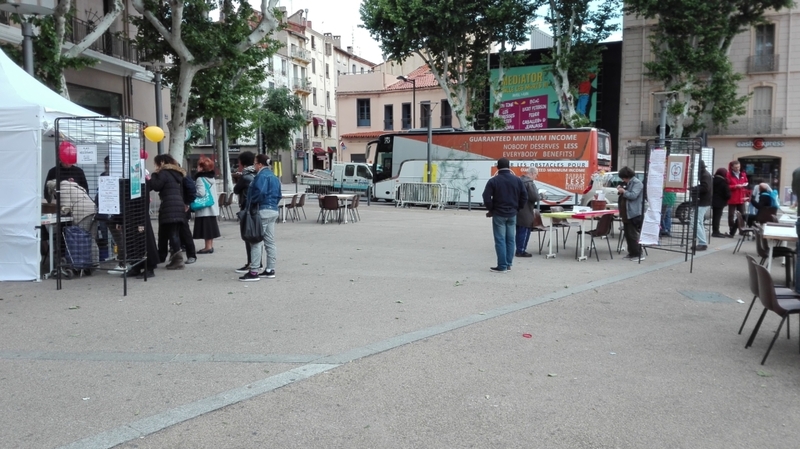 The weather wasn’t kind to us in Perpignan today, but the host team could not have been more prepared: information stands, a speakers corner, music band, a coffee corner and people there to offer direct information to people on their Minimum Income Rights. Perpignan, like many Mediterranean towns and cities has big gaps between wealthy people attracted by the ‘good life’ and people who live in the shadows of the ‘good life’. Perpignan has around 3000 minimum income recipients. Unlike Spain, there are common rules for Minimum Income Schemes through out France. 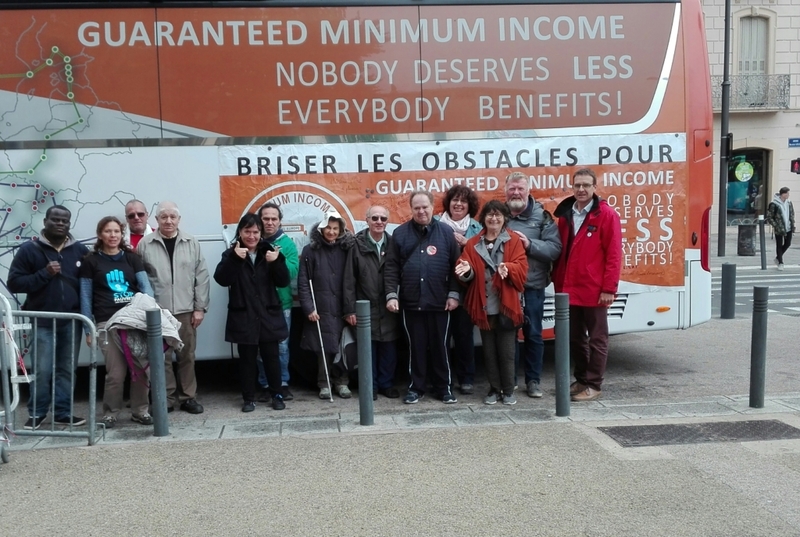 This is appreciated but a subject for discussion in Perpignan was the difference between the different Minimum Income Schemes for different categories of people. You have 10 minimum income schemes in France. There was a strong focus on the Minimum Income Scheme for people with disabilities, which is a more generous scheme but with that comes more uncertainty about costs for housing and health care for which they must make contributions making their realities more uncertain. Again housing featured as a key issue and the question of how well you could survive on the Minimum Income depended very much on the level of assistance available for housing which can vary greatly in the different areas. There was a good attendance of media in Perpignan. But it was disappointing, given the great efforts of the organisers, that there was an absence of representatives of Public Authorities. Those who had said they would attend, did not show. It was a strong reminder of how far we have to go to achieve political attention across the spectrum and actions to ensure adequate Minimum Income Schemes. 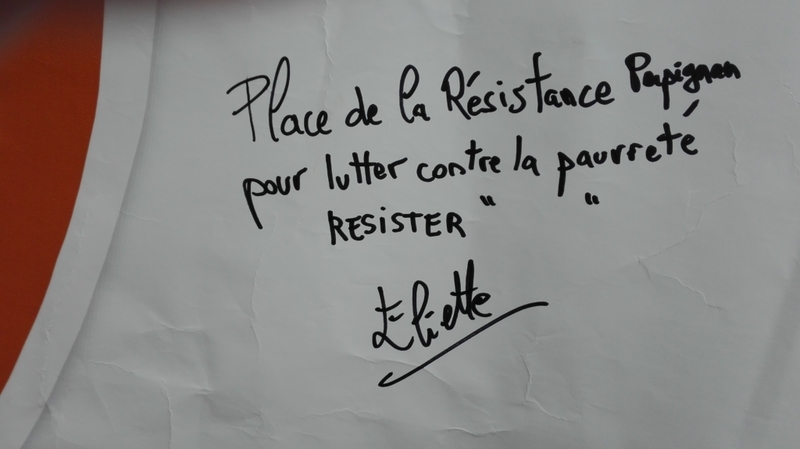 The bus was parked on Place de la Resistance and what better symbol could we have for the #eminbus; resisting poverty, resisting fatalism and resisting politics that divides rather than unities.